Are you ready to love every view of you? Wave Skin Care provides the best CoolSculpting in Surrey, Cloverdale, White Rock, Langley BC. The CoolSculpting fat freezing procedure eliminates stubborn fat safely and effectively, without surgery or downtime. This fat reduction treatment is the only FDA-cleared procedure to use controlled cooling to safely target and eliminate diet- and exercise-resistant fat. CoolSculpting results are proven, noticeable, and lasting, so you’ll look and feel great from every angle. Many people want to lose abdominal fat, but are hesitant about undergoing liposuction. Whether you want to reduce only minor areas of excess fat, remove love handles, or don’t have the time needed for recovery, liposuction might not be the right option. If you are healthy, close to your ideal weight, and have unwanted fat on the abdomen, back, or flanks, CoolSculpting may be the ideal solution. So, let us help reshape your body! Wave Skin Care will develop a customized CoolSculpting treatment plan that addresses your problem areas. Your individualized treatment plan will be tailored to your body, your goals, and your budget. This non-invasive procedure requires no needles, incisions, anesthesia, or downtime. The CoolSculpting procedure typically lasts 1 to 3 hours. Most patients relax during their treatment, reading, listening to music, or even sleeping. You can typically return to work and normal activities immediately. Additional sessions may further enhance your results. CoolSculpting in Surrey, BC and throughout Metro Vancouver has quickly become a popular non-invasive alternative to liposuction. The sooner you set up your consultation, the sooner you’ll see results in the mirror – long-term results in those areas that have resisted all efforts through diet and exercise. 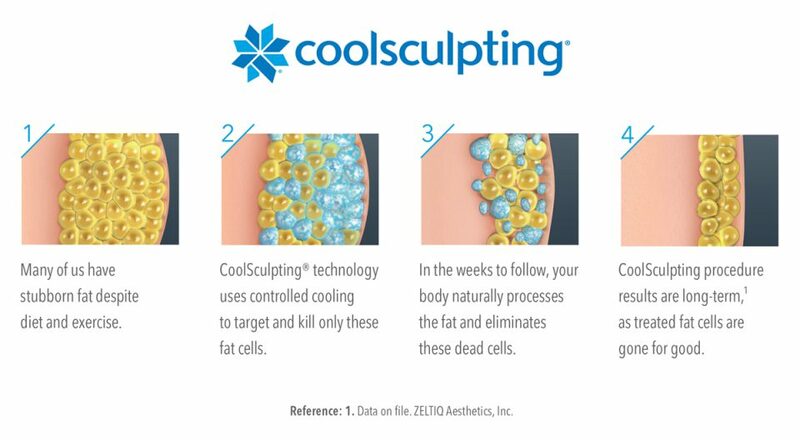 Contact Wave Skin Care today to find out if the CoolSculpting fat freezing procedure is right for you. The CoolSculpting procedure safely targets and freezes fat cells beneath the skin. Those frozen fat cells shrink, die and go away for good. The CoolSculpting fat-freezing procedure is the only FDA-cleared, non-surgical fat reduction treatment that uses controlled cooling to eliminate unwanted fat. Love what you see with our new non-invasive treatment to reduce fat under the chin and contour the neck. No needles. No surgery. No downtime. Take our “Am I a Candidate?” Quiz or request a one-on-one consultation with Wave SKin Care who will determine if the CoolSculpting procedure is right for you. The price for CoolSculpting procedures varies depending on your areas of concern, the number of treatments needed, and your ultimate goals. Most patients opt to receive treatments in multiple body areas in order to achieve their goals. The cost typically ranges between $2,000-$4,000 for their personalized treatment plan depending on the number of areas treated. We can create a customized treatment plan, in person, that’s tailored to your body, your goals, and your budget. We will help you create an individualized treatment plan tailored to your specific goals. The length of your CoolSculpting treatment will vary depending on the number of areas being treated during one visit. The latest technology of CoolSculpting can treat a patient in 35-60 minutes, some patients have more than one treatment during the same office visit. We may also schedule additional treatments or office visits in order to meet your goals. In the U.S., the CoolSculpting procedure is FDA-cleared for the treatment of visible fat bulges in the submental area, thigh, abdomen and flank, along with bra fat, back fat, underneath the buttocks (also known as banana roll), and upper arm. In China, the cryolipolysis system is used for fat layer reduction of the abdomen and flanks. In Taiwan, the CoolSculpting procedure is cleared for the breakdown of fat in the flank (love handle), abdomen, and thigh. Outside the U.S., China and Taiwan, the CoolSculpting procedure for non-invasive fat reduction is available worldwide. Yes! The CoolSculpting procedure can treat visible fat bulges under the chin (submental) and jawline (submandibular). Freezing away fat from a double chin is as easy and tolerable as using the CoolSculpting procedure in other parts of the body (e.g., abdomen, flank/side, thighs). It is also FDA-cleared to affect the appearance of lax tissue with submental area treatments. With CoolSculpting treatment for a double chin, patients see results after just 1 to 2 visits. And with no surgery, and little to no downtime. Once the treated fat cells are crystallized (frozen), they die and are naturally processed and eliminated from the body. As the cooling begins during the first few minutes, you typically feel intense cold. This soon dissipates. With some applicators, you’ll feel some pulling as suction is applied. The area generally goes numb within 5 to 10 minutes during treatment. Many people read, watch videos, work on their laptop, or even take a nap during their CoolSculpting treatment. After the treatment, you may feel some tingling as the area is massaged for 2 or 3 minutes. Patients are usually able to return to normal activities following their appointment. In the US, the CoolSculpting® procedure is FDA-cleared for the treatment of visible fat bulges in the submental area, thigh, abdomen and flank, along with bra fat, back fat, underneath the buttocks (also known as banana roll), and upper arm. It is also FDA-cleared to affect the appearance of lax tissue with submental area treatments. The CoolSculpting procedure is not for everyone. You should not have the CoolSculpting procedure if you suffer from cryoglobulinemia, cold agglutinin disease, or paroxysmal cold hemoglobinuria. The CoolSculpting procedure is not a treatment for obesity. You can consult with us. Yes, you can. The CoolSculpting procedure is completely non-surgical, so typically you can return to normal activities immediately. Patients often return to work on the same day after a CoolSculpting treatment is completed. You may start to see changes as quickly as 3 weeks after your treatment, and will experience the most dramatic results after 2 months. Your body will still continue to flush out fat cells for up to 4 to 6 months after treatment. Always be sure to schedule a follow-up assessment with your CoolSculpting provider to review your results and discuss the option of additional treatments. Try to maintain a healthy lifestyle. A healthy body is a happy one. And we want you to be happy with your results! No supplements are required after your CoolSculpting treatment. It’s not a diet and exercise program, so you won’t need to change any of your lifestyle habits. Many patients do feel more motivated to take care of themselves after a CoolSculpting treatment. It’s as if they got a second lease on their body! They want to take even better care of themselves. Many people, after seeing the results from their CoolSculpting procedure, feel even more motivated to stay close to their ideal weight. However, if you do gain weight, you may gain it evenly all over your body, not just in the treated areas*.